There is something about families gathering that often brings about storytelling. Stories begin to flow about holidays past, or childhood events. The pater and mater familias will reminisce about when the kids were little, or siblings will recount hilarious mishaps perpetrated on one another or on neighbors. Such is often the conversation around the Edwards’ family table when we gather. But, for me, stories begin before they have even arrived. Memories flow as I’m setting the table. 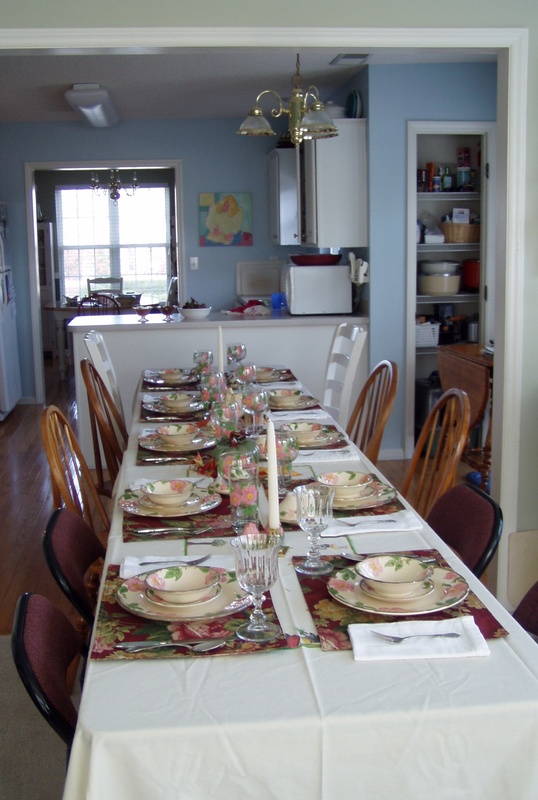 This year, we needed two “church tables” end to end to accommodate the “adult table” alone. I decided not to purchase matching tablecloths, but rather to use two similar ones I already had…and the reminiscing began. One tablecloth I’ve had since the summer after my sophomore year in college when I traveled to Ivory Coast, West Africa. During the six weeks I was there, a missionary gave me a beautiful tablecloth hand-painted by a talented native of Cote d’Ivoire. Spreading the cloth brought back all manner of sights, sounds, smells, and things learned on that memorable trip. The next cloth I laid down was made when I was newly married. 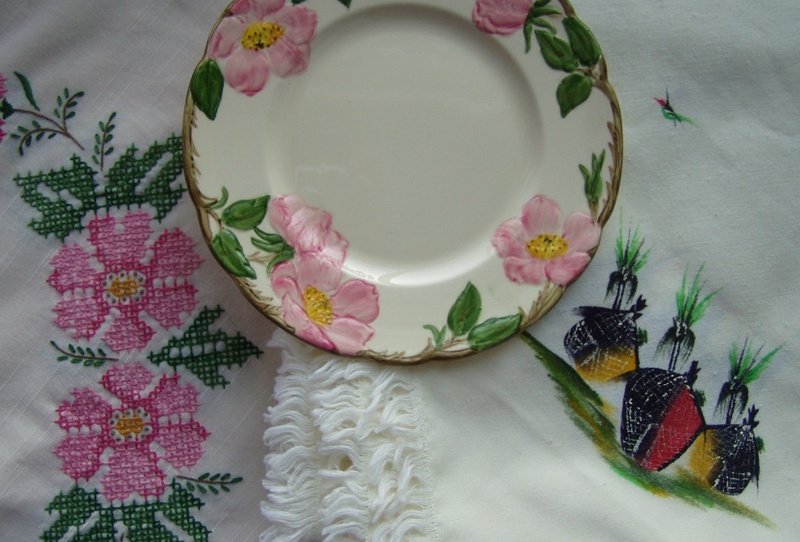 I cross-stitched the cloth using colors to match the Desert Rose stoneware I had gotten as my “china”. I remember wondering how the cloth would hold up as the years wore on…some twenty-or-so years later (and many washings and dryings), it is still looking almost new. And then the Desert Rose. These dishes grow more precious with each passing year. 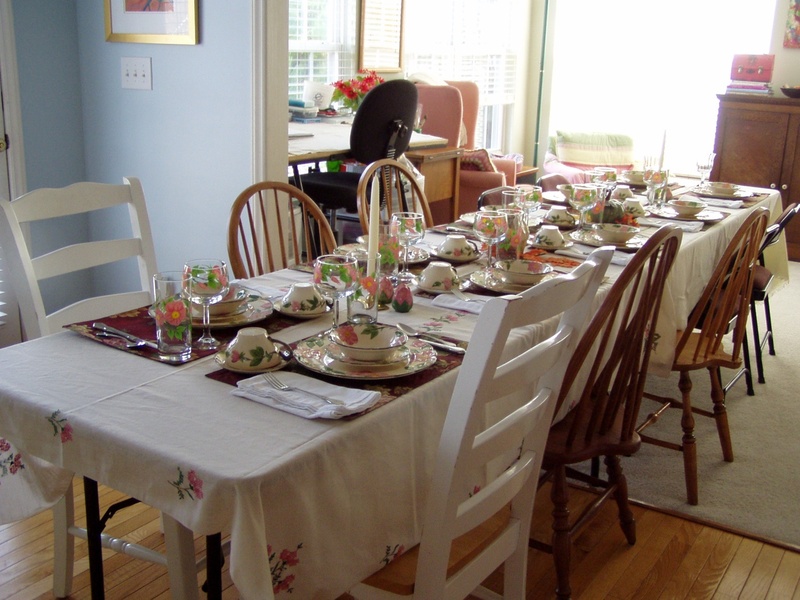 I’m transported back to the tiniest of kitchens where my grandmother Catherine, seemingly effortlessly, set a table and feast fit for a king. I remember Thanksgivings, Christmases, and other times eating off of these dishes overflowing with delicious food, always topped off by her famous pecan pie (pronounced PEEcan pie, emphasis on the first syllable). The conversation was interrupted multiple times as my dad and his brother would ask their mama to come sit down and eat, but to no avail. She was, it seemed, happy to eat while hovering over our needs… bringing drink or whatever was running low. There’s more on this from a previous blog about these dishes here. But the stories continued about these dishes as my in-laws arrived for Thanksgiving Day this year. My father-in-law’s parents had the “Apple” version of Franciscan ware. His aunt had the Desert Rose. His own memories flood in upon seeing the table. That is one of the wonderful things about Thanksgiving…the connections and ties to all the generations of families and family gatherings. It brings an ache that is both melancholy and joyful. I love how you captured the essence of the table. It’s looks like it was a lovely meal. Wonderful memory painting and posting. We had our usual family members – together for the 20th year – since we returned to the Northeast and the few “strays” two adult daughtes from two couples that have been friends for life). These occasional guests always keeps it so much more interesting because they haven’t heard all of the old stories. Great sketch, happy splashes! Thank you for sharing your story. What a beautiful story and table! Both the post and sketch are wonderful! 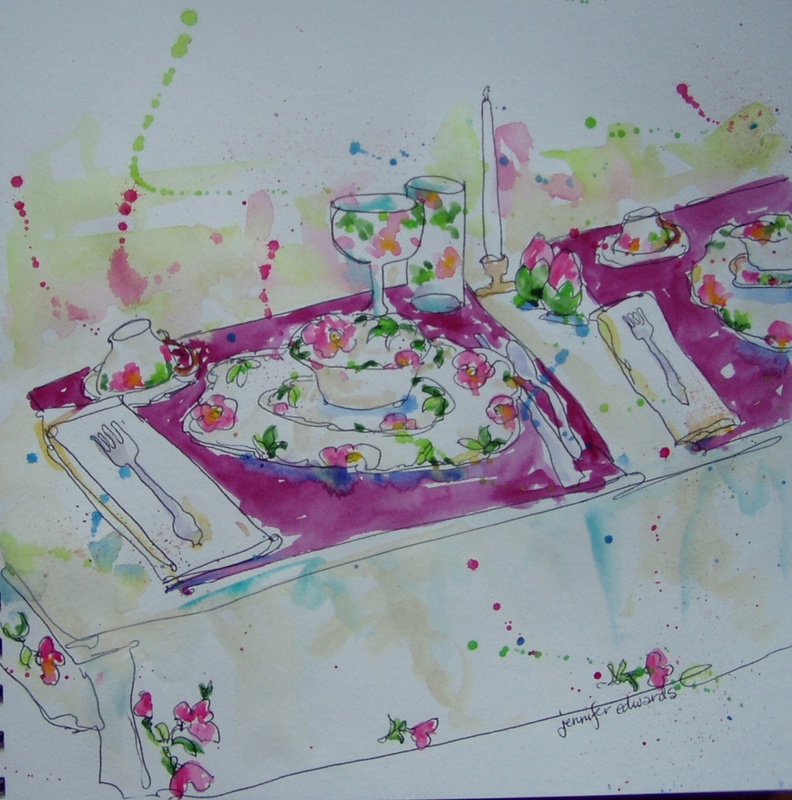 Lovely china (one of my favorites), table setting, art, and creativity. I LOVE your combination of watercolors and yarn art — so creative! Your watercolors are so amazingly fresh! I just awarded your blog with an award; see my blog for details. I have the same dishes, from my grandmother. How wonderful to see them photographed so beautifully. BTW – just discovered your charcoal portraits, FANTASTIC!